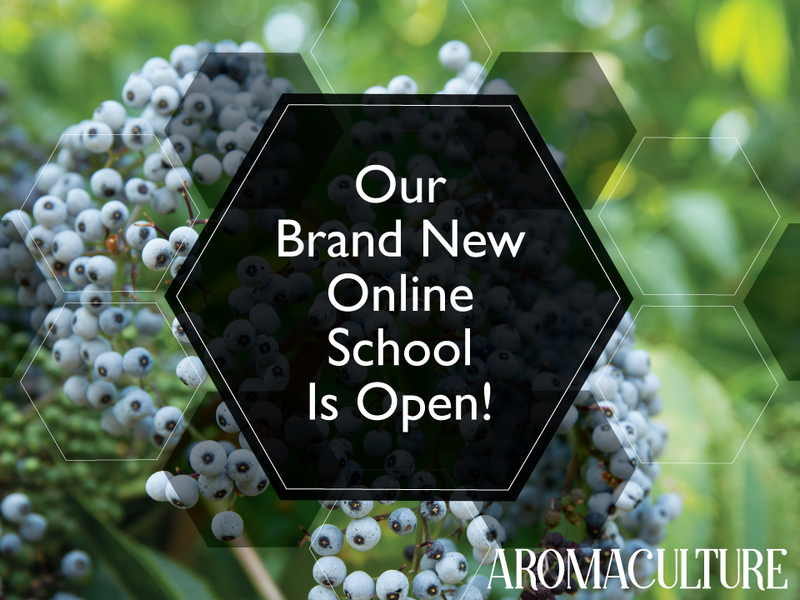 Jon and I are thrilled to announce that our online school is now open! I can't believe it! It seems so surreal to know that it's finally up and that in just a few short days, we'll be opening our very first online workshop for enrollment! It fills us with so much hope to think that we might be able to share what we know to help inspire and help you as you continue to learn more about plants and sustainability and living in harmony with the earth and all of the living beings that dwell on it. First, we want to assure you that the magazine will still continue to live here at AromaCulture.com. It's not moving over to the new school's website. This means that everything magazine-related will still be right here where you're used to seeing it. The site is staying the same, so you'll still be able to find the magazine issues (past and present) here in the shop. Because I really want to focus on making sure that I'm only putting out high quality content for you, I've decided to continue writing only one blog post each week (which is what I do right now). Instead of trying to write one post for AromaCulture and one post for Floranella each week, I'm going to continue to write one post a week and, from now on, the blog posts will be published each week on Floranella.com. The only reason I'm moving the blog over to the new website is that it makes sense for me to keep the majority of the educational content I'm writing in one place and since the school is going to be the online home for that, it's the best place for the blog to live from now on. If you already get an email letter from me every Tuesday, you'll still receive a link to the blog post each week, but the link to it will take you to the blog post on Floranella instead of AromaCulture. The podcast will continue to live here at AromaCulture, at least for now. To keep things simple so I can focus on quality over quantity and avoid sending duplicate content to people, I'm going to continue to have just one email letter list instead of having two separate lists. So whether you sign up for our insiders list here at AromaCulture or Floranella, the email sent out each week will be the same (you'll only receive one, not one per brand, so you don't need to sign up again at Floranella if you already get letters from me on Tuesdays). The emails will look a lot like the ones you're already used to seeing from me, with a link to the week's blog post, podcast episode, etc., but they will say that they're from Erin Stewart instead of saying that they're from one of the brands - AromaCulture or Floranella - since each email is essentially a weekly letter from me anyway. Our online Facebook community for our Insiders group will be shared by AromaCulture insiders and Floranella insiders. If you're already a member of our Insiders Facebook community, you don't need to join again through Floranella (it's the same group). I'll be updating my social media handles in the next few days so that I can continue to maintain just one account per platform where I can post about all things Floranella + AromaCulture in one place (instead of having separate accounts for each that look a lot alike). The content won't be changing; just the username. I'll update links accordingly. In just a few days, we'll be opening enrollment for our Summer Foraging workshop. In it, you'll learn how to properly identify, forage for, and harvest + use 12 common edible and medicinal plants in a way that is sustainable, ethical, and that helps rather than harms the local ecology. Jon has really done an excellent job with these seasonal foraging workshops and we're both really excited to share them with you throughout the year. We'll release a seasonal foraging workshop each quarter until all of the seasons have been covered. You can learn more about the Summer Foraging workshop by clicking here. I can't thank you all enough for your support as we've been working to get these things ready to share with you. We really have the best community, I think, and I am so excited to continue learning with you all. This article has been adapted from an article I first published in the February 2017 issue of AromaCulture Magazine. There are many generous plant families. The Lamiaceae and Asteraceae families, for example, each give us dozens, if not hundreds, of medicinal and edible plants that we can use in the apothecary. But one of my favorite plant families is the Rosaceae family. There's something extra special about the plants that come from it and I think that special-ness carries over into the carrier oils that are derived from Rose-family plants. While they are recognizably beneficial and nourishing to the skin, I believe they also carry that special energetic signature of the Rose family and can help us to further layer therapeutic effects into our apothecary blends. These 5 carrier oils are some of my favorites to use when blending salves, creams, massage oils, aromatherapy blends, and other oil-based products. Rosehip seed oil is made when the seeds inside the hips of the roses are cold pressed. The unrefined oil is usually a vibrant, golden-orange or orange-red color and has a light aroma that noticeably changes when the oil has spoiled. It has a relatively short shelf life (6-12 months), so should be stored in the refrigerator in a dark, airtight container. When the oil is unrefined, it will often take on a waxy consistency when chilled and must be brought back to room temperature for use in recipes. Some suppliers refine their Rosehip seed oil or ‘winterize’ it (so it doesn’t become waxy in the fridge) and their oils may be much lighter in color than the vibrant tones you may be accustomed to in an unrefined oil. Adulteration of Rosehip seed oil is common, especially now that the oil is in shorter supply with a higher demand for it, so you’ll want to purchase yours from a trusted source, as local as possible. I've come across adulterated Rosehip seed oil from several of the larger, popular distributors, so you'll want to closely examine your product as soon as it arrives to make sure it is pure. Rosehip seed oil is a drier-feeling oil that soaks into the skin immediately and is very hydrating. It does not leave a greasy feeling or an oily residue and can be used for all skin types, but is especially suited to dry, sensitive, or mature skin. It is gentle enough to be used undiluted, but because of its higher price, it is usually used in combination with other carrier oils and is often included as an ingredient in luxurious skin care recipes and creams, facial serums, and body lotions and oils. I like to include it in face creams and scar-fading blends. Incredibly skin nourishing, Rosehip seed oil is rich in essential fatty acids, antioxidants and vitamins that benefit the skin. Linoleic, Linolenic, Oleic and Palmitic acids are present, as well as Vitamins A and C (the latter in higher amounts than are found in oranges!) and Lycopene. The Vitamin C content contributes to the oil’s skin rejuvenating properties and works alongside the Lycopene and other nutrients to restore elasticity to the skin, promote collagen production and assist with repairing, restoring vibrancy to, and protecting the surface of the skin. Some studies show that it can help to reduce the appearance of scars when consistently applied over time and the oil has also been used to help rebalance, restore, and regenerate the skin in cases of eczema, wounds, burns, damaged skin, broken veins, fine lines and wrinkles, acne and other skin issues. Trans-retinoic acid is also present in Rosehip seed oil. Chilean studies found that this component is an effective tissue regenerator and helps to tone the skin, minimize premature aging and wrinkles, and reduce scar tissue. True Sweet Almond oil is a light, cold pressed oil that is produced from the Almond nut and easily penetrates the skin. It’s often used in skin care blends and body oil products, but is also sometimes used in the kitchen. The refined oil tolerates higher temperatures because of its high smoke point and can be used in general cooking while the unrefined oil is better suited as a dressing or finishing oil or in cooking that involves medium temperatures. Sweet Almond oil is commonly used by soap makers because it is a nutrient-dense, stable oil that produces a nice lather. The oil is rich in fatty acids, vitamin E, vitamin A, vitamin K, and B vitamins 1, 2, and 6 and is moisturizing and nourishing for both the skin and the hair. It is well suited for use in skin care products for all skin types, but especially for those with normal, combination, or dry skin, and does not clog pores. It helps to increase circulation while its anti-inflammatory properties work on soothing irritated and inflamed areas, thus regenerating and restoring the skin. It is sometimes employed in blends for use with eczema and other skin conditions because it can help to relieve the itching and irritation associated with them. It is sometimes included in blends used to help reduce the appearance of scars. Heat will shorten the shelf life of this oil, but properly stored away from light and heat, the unrefined oil should keep for 12-15 months. Since it is a nut-derived oil, you should probably avoid using it if you have a nut allergy. Apricot kernel oil is another light, mild oil that is also cold pressed, this time from the kernel inside the pit of the apricot fruit. It is somewhat like Sweet Almond oil and is often used in its place when it is not available. It makes a lovely base for massage oils and is well suited as a natural baby oil that can be used to soothe and moisturize the skin of little ones. Apricot kernel oil can be used in blends formulated for all skin types, but is especially suited to mature and sensitive skin. It is absorbed quickly and doesn’t leave behind an oily residue. Its anti-inflammatory properties lend themselves well to soothing irritated skin, so the oil is often used in blends for addressing inflamed, itchy skin issues. The unrefined oil is the best option for use on the skin because it retains more of its nutrient profile than the refined, expeller pressed oil does. The unrefined oil is extremely rich in essential fatty acids and vitamin A, vitamins B 1, 2, 6, and 17 (B 17 content is the highest of any plant), and vitamin E. The oil’s high antioxidant and vitamin E content contribute to the oil’s protective, purifying nature. It’s restorative and soothing, contains anti-aging properties, helps to prevent the fine lines and wrinkles that are accompanied by premature aging, and helps to improve the elasticity and texture of the skin. I love to use it in body lotion recipes. This oil should be stored away from sunlight and heat in a cool, dry place. The refrigerator is probably best. Stored properly, this oil can keep well for about a year. As you can imagine, it takes a lot of tiny, cold pressed raspberry seeds to produce this precious, nutrient-dense carrier oil. It’s an incredible anti-inflammatory oil that is used to soothe irritated and inflamed skin. It also has a special affinity for oral health care. This oil is often used in skin and hair care products. It’s lovely when included in facial serums and massaged into the skin. Since it is high in antioxidants, it partners well with the skin to help protect and nourish it. It’s rich in essential fatty acids (about 83%) and vitamins A and E. The oil is also being studied for its potential as an oil that helps to protect the skin from UV-A and UV-B rays. While there isn’t yet enough research to use it as a replacement for sunscreen, it does show some promise in this area. The cold pressed oil is the best option for use. Stored properly, it should keep well for about 2 years. Peach kernel oil is a light, slightly astringent oil that is rich in essential fatty acids and vitamins A, B and E. It is moisturizing, skin nourishing, and helps to improve the elasticity of the skin whilst soothing inflammation and irritated areas. It’s well suited to all skin types and is useful in anti-aging formulas and in blends used to address eczema and other skin conditions. It’s similar to the other light oils like Sweet Almond and Apricot kernel oil, but it isn’t produced as abundantly and is thus much more expensive and can be harder to find. Less information is available about this particular oil, but we do know that it is a valuable carrier. Culpeper (1616-1684) said that the oil would bring rest and sleep when applied to the forehead. There are other carrier oils available from this beautiful plant family. Blackberry seed oil and Cherry pit oil are two of them. They are not as easy to find on the market, but if you ever come across them, they are worth studying and experimenting with. These five oils are some of the easier ones to find. I hope you’ll give them a try if you haven’t already! Do you have a favorite carrier oil that comes from the Rose family? Tell me about it in the comments section below. It’s no secret that I’m a huge Lavender fan. When we purchase our land, I want to plant at least an acre of it and have a varietals garden where I can permanently plant all the varieties I’ve collected throughout the years. Lavender is one of my two absolute favorite herbs and I love including it in my recipes. It’s so versatile and suits almost everyone! June marks the beginning of Lavender season here in the PNW, so this month, we're celebrating this favorite herb of mine with a magazine issue entirely dedicated to Lavender and we're preparing to launch our Lavender documentary film! I can hardly wait to share it with you. So, in honor of this versatile herb, here are 86 things you can do with Lavender. All you need to make Lavender wands is some fresh, long-stemmed Lavender (the L. x intermedia varieties work best) and some ribbon or twine. There are many tutorials on Youtube. They're quick and easy to make and they keep your drawers Lavender-scented for years! Made with a wreath form, floral wire, and fresh Lavender stems, these Lavender wreaths dry so beautifully and hold their color for ages. I have one on my wall that's a year old and it's still fragrant! Another, larger wreath came with us from southern California and has kept its scent as well. Many Lavender farms have Lavender wreath-making classes throughout the blooming season. It's a great opportunity to get together with some loved ones and make something lovely. If you like to sew, you can make Lavender sachets in any shape or size. I like to embroider mine! But if you don't like to sew, you can make sachets with drawstring cloth bags as well. Lavender eye pillows are Lavender sachets that are sewn in an eye mask shape. You can lay the pillow over your eyes and lean back to relax while soaking your feet in a Lavender foot bath to help ease headaches and tension after a long day. WHAT IS YOUR FAVORITE THING TO MAKE WITH LAVENDER? I'D LOVE TO HEAR ABOUT IT IN THE COMMENTS SECTION BELOW.